A busy few days lie ahead for Ballymore stables with runners at five different meetings over the weekend. We kick off at Moonee Valley on Friday evening - hoping that Tempest Rock can sneak a run in the Eastcoast Energy Plate in which he is unfortunately a third emergency. Still a maiden - but one with plenty of talent - the son of Group One mare Tempest Morn has been crying out for distance and the 2040m looks ideal. "He is going well and the step up in ground will help," Michael Moroney reported - "he just needs to get a run!" Later in the night Baqaat looks nicely placed in the Sportingbet Best Tote Plus Handicap - stripping fitter for her excellent first up second at Pakenham. "Her first up run was very good," said Moroney, "and she has trained on well. We expect her to run a great race with Glen Boss aboard." At Flemington on Saturday we cheer on two runners, the first of which is Surpass (pictured) in the Johnstaff Projects Handicap. Having his first start since late September, the talented stayer is likely to find the 1410m a bit short although he has freshened up nicely. "Any rain about would help him," Moroney said. Later in the day Flashy Fella takes his place in the Zouki Western Health Cup and we are hoping that from barrier two with Damian Lane aboard he will enjoy a good run. "He was pretty unlucky last start," Moroney noted, "he got too far back after striking severe interference in a really slowly run race." "Hopefully this time he can settle a bit closer and be in the thick of things at the finish." At Benalla on Sunday we saddle up Air Striker in the Sportsbet.com.au Top Tote Plus BM64 Handicap and we are looking for him to bounce back from a Ballarat last on demanding going. "He just didn't handle the heavy surface," said Moroney, "so we can put a line through that run. His previous run was good and with the right luck he will prove hard to beat." Sunset Magic is the third of our Werribee runners on Sunday, due to contest the Kids Summer of Country Racing 12th Jan Maiden Plate over 1600m. Close up when resuming at Bendigo, she raced greenly and has the benefit of a couple of gear changes. "She may've won there if she'd just gone straight," Moroney said. 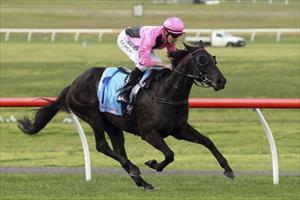 Garud is our runner in the feature event of the day, the $120,000 Listed Werribee Cup - a race his form reads well for. Apart from a heavy track failure in the Ballarat Cup, the imported galloper has been in consistent form. "He is going really well and he looks nicely weighted," said Moroney - happy with the alloted 54kg and the fact that Glen Boss again takes the ride. Our final runner for the weekend is Walloon Region NZ Bloodstock Christmas Classic Showcase BM70 Handicap and he looks nicely placed at the mile after running well first up over 1300m. "His run from a wide draw that day was very good," Moroney said, noting that this time the Danzero gelding has drawn nicely in barrier four with Dwayne Dunn aboard. "A bit of rain about would help him but he is a nice horse who we expect to be in the finish."